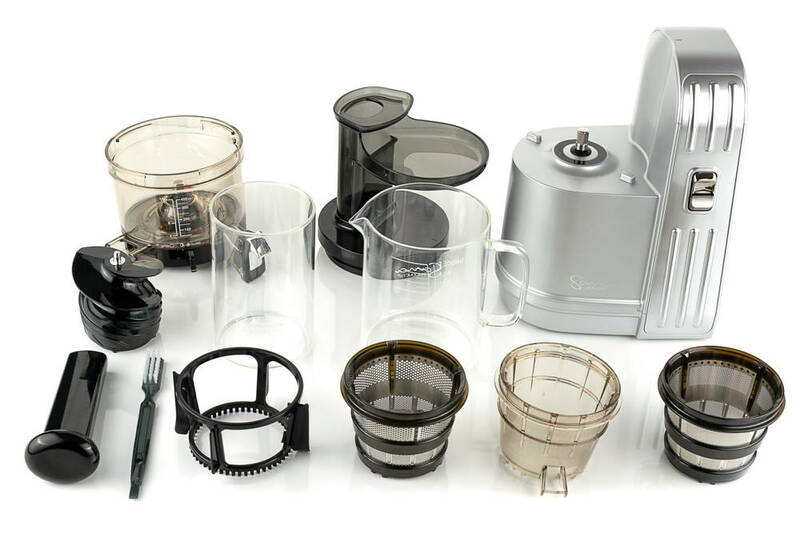 Sana's next-generation vertical juicer is here. 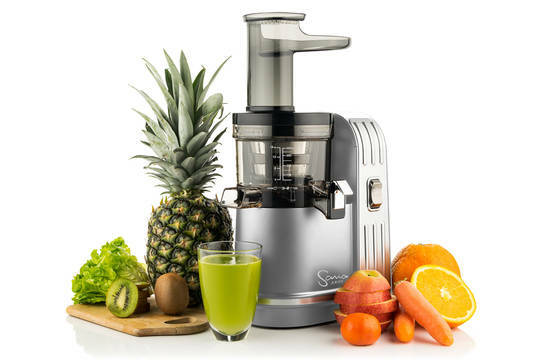 Sana takes the next step forward in juicing technology with the new 828 vertical juicer. 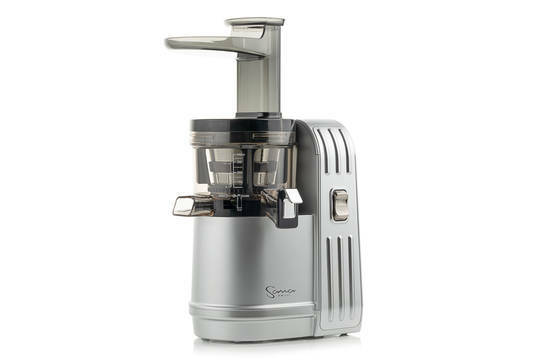 Combining a sleek new design with some ingenious new features, the Sana 828 is the most advanced vertical juicer on the market. Drinking cold-pressed juice is one of the easiest ways to improve your health. 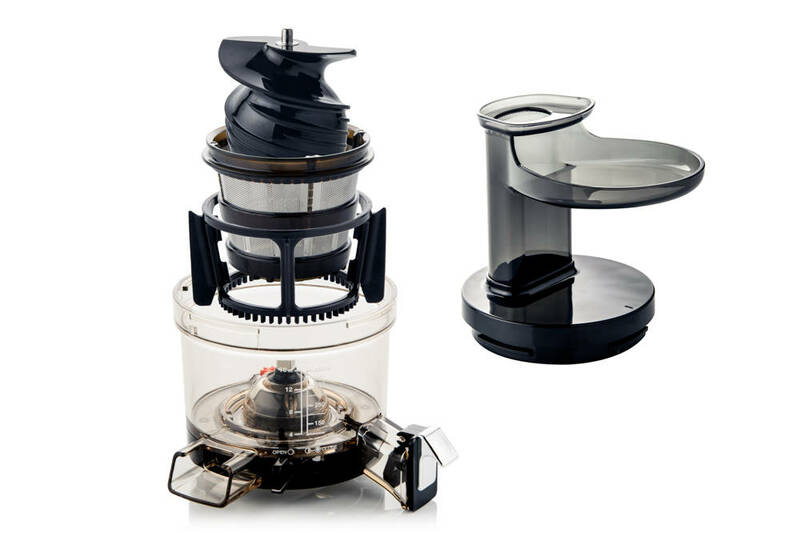 But what good is a juicer that is never used because it's too big, too loud, or too difficult to clean? That's why Sana's new 828 juicer is designed from the ground up to be the easiest juicer you've ever used. 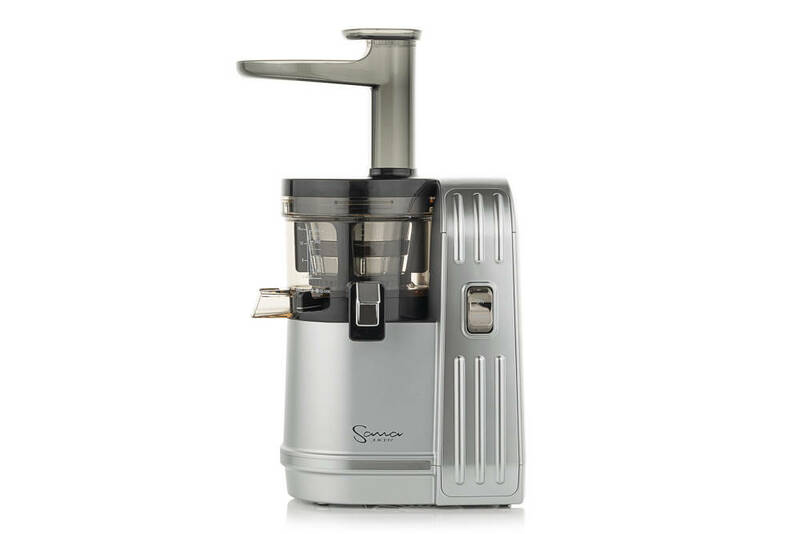 Quiet, compact, and simple to clean, the Sana 828 moves vertical slow juicing into the next generation. Oh, and it looks pretty nice too. The juicing chamber in the Sana 828 has been redesigned to make it the most efficient and easy to use vertical juicer on the market. 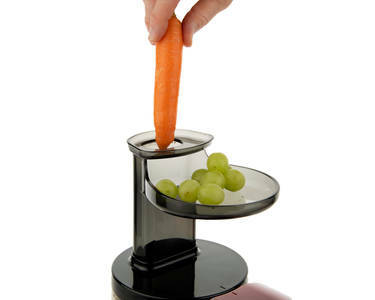 The pulp control lever lets you adjust the pressure in the juicing chamber, allowing higher yield with harder ingredients like carrots and easier cleaning with softer and stringy produce like pineapples. The new auger has been designed to simply be inserted in the juicing chamber without having to be lined up with the juicing screen. 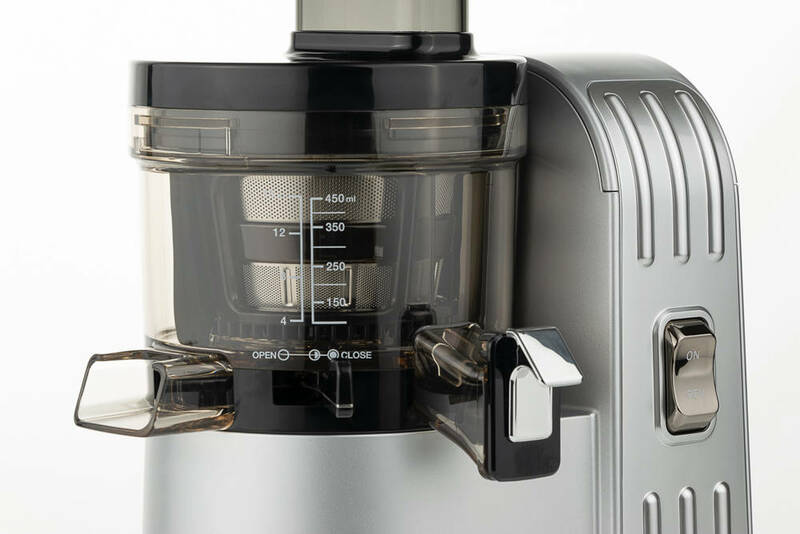 Silicon cleaning blades rotating at a low 17 rpm not only keep the screen clean during operation, but also minimize foaming in the juice. 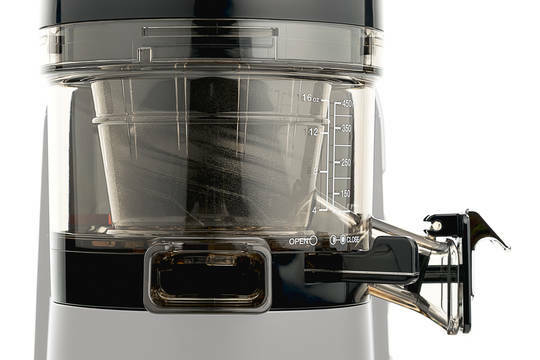 The pulp outlet chute has been made wider with a large opeing in the top to make cleaning easy. Finally, the drive shaft is sealed in the juicing chamber, eliminating any possibility of juice leaking onto the motor base. Most vertical juicers come only with one juicing screen. Sana's new 828 triples that with three screens. The standard fine stainless steel screen is designed to get the maximum yield and clearest juice out of most produce. 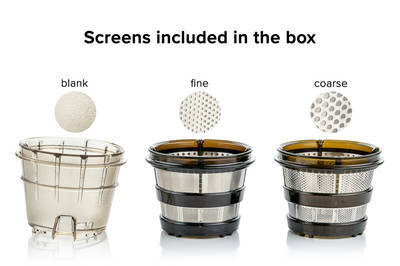 Also included is a coarse stainless steel juicing screen with larger holes which allow softer and fibrous produce like pineapple, firm peaches, and berries to be juiced - something most juicers can't do. Finally, an ice cream screen is included for making frozen treats like fruit sorbets and banana-berry ice cream. Manufactured from premium materials in a high-tech South Korean facility, the Sana 828 is designed for a lifetime of service. 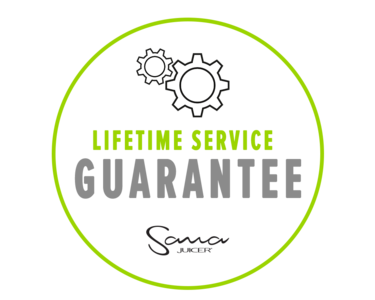 That's why we back it up with a lifetime service guarantee – all service work for the life of your Sana 828 is free of charge. If you have any problems with it after the 5/10 year warranty period is over, we will service it free of charge. You only pay for shipping to our service center and any parts needed. We will pay for the labor and shipping back to you. This attachment fits on the motor base to turn your Sana EUJ-828 into a powerful citrus juicer. 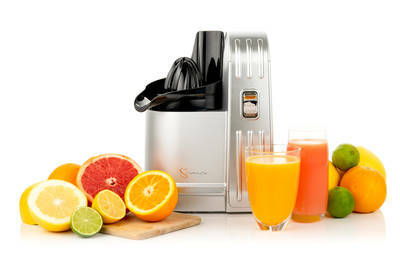 This allows you to juice oranges, lemons, limes, grapefruit and other citrus without peeling the fruit. It is a quick way to get your morning orange juice fast - just juice and rinse. Auger for Sana jucier EUJ-828. Drum for Sana jucier EUJ-828. Drum base for Sana jucier EUJ-828. 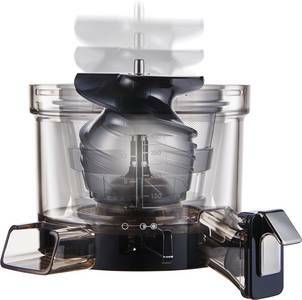 Ice cream maker for Sana jucier EUJ-828. Coarse screen for Sana jucier EUJ-828. Fine screen for Sana jucier EUJ-828. Hopper for Sana jucier EUJ-828. 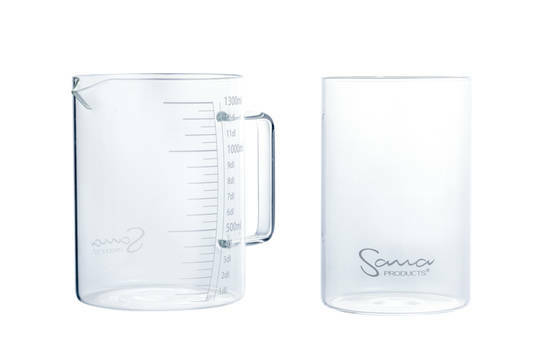 Brush holder for Sana jucier EUJ-828. Silicone blades for Sana jucier EUJ-828. Juice flap seal for Sana jucier EUJ-828. Juice flap without seal for Sana jucier EUJ-828. Juice flap with seal for Sana jucier EUJ-828. Pulp flap for Sana jucier EUJ-828. Pusher for Sana jucier EUJ-828. Body shaft seal for Sana jucier EUJ-828. Drum shaft seal for Sana jucier EUJ-828. Middle gear for Sana jucier EUJ-828. Cleaning brush for Sana jucier EUJ-828.